When we began our Survivor Insight Series, one of the first survivors who wanted to speak to us about mesothelioma was Christine S. We want to thank her again for contributing to the Wall of Hope and inspiring mesothelioma patients around the world. We are sorry to report that Christine passed away in August 2013. Her last name is being withheld over privacy concerns. 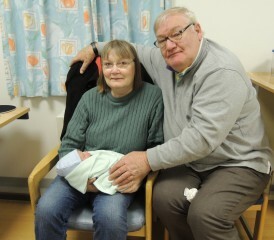 What was it like to experience the birth of your first grandchild? Our first grandchild, Aidan James, was born on Dec. 13, 2012 at 1:29 p.m., weighing in at 7 pounds 4 ounces. He’s the double of his daddy. This has been fantastic news for me and another reason to kick meso into touch for a lot longer. It gives me more strength to be around for as long as possible — to enjoy Aidan growing up, see all the changes and even to see him running towards me with his arms outstretched. 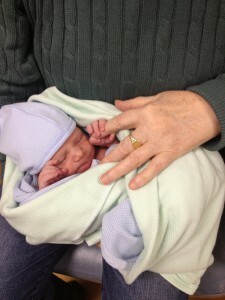 When I saw him and was blessed to hold him I burst out crying. I sort of regained control, and then this tiny hand came out of the blanket he was wrapped in and latched onto my finger. I cried all over again. It was a miracle for me, and one I never thought I would be around for. What were you feeling when you found your mesothelioma cancer had grown? I knew the meso would grow again (you can never get away from that), you just hope it takes longer. I have lived with my diagnosis for five years, so in terms of other sufferers I am lucky. So I wasn’t surprised when I was told it had grown a small amount. Obviously disappointed, but it could have been a lot worse. How often do you get scanned for mesothelioma? I have a scan around once a year. One year I was scanned twice as I was suffering a lot more pain than normal. Some sufferers at different hospitals get scanned a lot more often. I get X-rays in between also. You mentioned you didn’t feel ready for chemotherapy. Can you tell the community why? What does it take to be physically and mentally ready for something like chemotherapy? When I found my meso had slightly grown, I had been through a long period of pain and no painkillers seemed to work. I had liquid morphine, but my body just does not get on with morphine, even with anti-sickness tablets. So, physically I believe I could not have coped with further chemotherapy, which was offered at that time. I mentally could not have coped either. I have to be at a point where I am in control and believe that I am doing the right thing at the right time and, therefore, I declined chemo. I am in a better place now. The pain comes and the pain goes, and I am better able to judge how to cope. When the meso grows again I will then have to reconsider further chemo. I am now on slow release morphine tablets which I am coping with far better. The pain is under control at the moment. What were some of the past challenges you had with chemotherapy? The first time with chemo I felt I had no choice. I thought this was the only chance to maybe get some more years to live.I was told some of the side effects to expect, and I must say the oncology staff at my hospital was excellent. I liked the way the suite was set out and I relaxed a lot more. I was sick really badly just once. I was given so much additional medication to stop this, but I wasn’t sure it if was working anymore. The constipation, especially near the end of the chemo, was terrible. I had sore eyes and was ready to throw the towel in after the third session. My oncologist changed the Cisplatin I was receiving with another drug and still kept the Alimta in the mix. The last three trials were a lot easier in that they didn’t take as long. I am not looking forward to further chemo. Well, who would? Has your attitude or perspective changed over the last year? I definitely think my attitude has changed over the last year. I suppose I cannot accept I am going to die any time soon. What helped me in the beginning was thinking, “Well, I have terminal cancer, but I could catch something else that could take me or I could get flattened by a bus or whatever.” What I always hope and pray for is that one day someone will come up with a cure. You have to believe this. Also, in Britain, we don’t seem to have as many choices as you do in the United States. You seem to have a lot more treatments available to try out, like cryoablation, for one. I was going to try that instead of chemo again, but I am not as strong as I was five years ago and I’m convinced the plane journey would be too difficult. It would also cost a lot of money, not just for the operation, but for the travel and accommodations on top of that. So, it is back to the drawing board. But the longer I live, I continue to thank God for giving me the willpower to believe I will fight the fight to the end. My perspective remains always positive. If you are interested in contributing to our Wall of Hope as well, please feel free to contact us at outreach@asbestos.com.